Custom Chocolate Casino Dice. Be it keys, cars or tools, the sky's the limit with our many shapes and sizes. 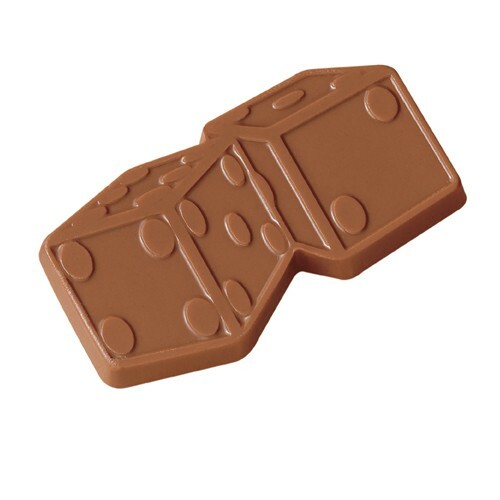 We can customize our chocolate to virtually any shape and size to give you almost endless possibilities. Choose Milk or Dark Chocolate. Choose from a shape shown, or have us make a totally custom cutout shape. Individually cello sealed. Gift Box or foiling is additional. Personalize mold to fit your logo or message. The imprint area on the rectangle is 3" X 2". The entire rectangle is 3 1/4" X 2 1/4". The imprint area on the round piece is 2 3/4". The entire round piece is 3". The imprint area on the square piece is 2 3/4" X 2 3/4". The entire square piece is 3".